"This is a quick, easy and tasty dessert. 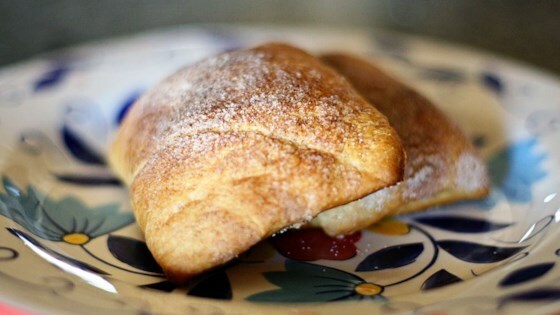 A rich and creamy filling surrounded by a crispy cinnamon crust makes this a favorite for anyone who loves a sweets." Preheat an oven to 350 degrees F (175 degrees C). Prepare a 9x13 inch baking dish with cooking spray. Beat the cream cheese with 1 cup of sugar and the vanilla extract in a bowl until smooth; set aside. Unroll the cans of crescent roll dough, and use a rolling pin to shape each sheet into 9x13 inch rectangles. Press one sheet into the bottom of a 9x13 inch baking dish. Evenly spread the cream cheese mixture into the baking dish, then cover with the remaining piece of crescent dough, and brush with melted butter. Stir together 1/2 cup of sugar with the cinnamon in a small bowl, and sprinkle evenly over the top of the cheesecake. Bake in the preheated oven until the crescent dough has puffed and turned golden brown, about 30 minutes. Allow to cool 10 minutes before serving. A deliciously different cheesecake with a Mexican twist. Simple and delicious. Defiantly worth making. I even used light cream cheese and reduced fat crescent rolls and it was perfect.